CHARLOTTESVILLE, VA, DECEMBER 4 — The Composting Collaborative, a membership-based industry group led by GreenBlue, the U.S. Composting Council and BioCycle Magazine, has launched the first-of-its-kind directory to Pretreatment systems. 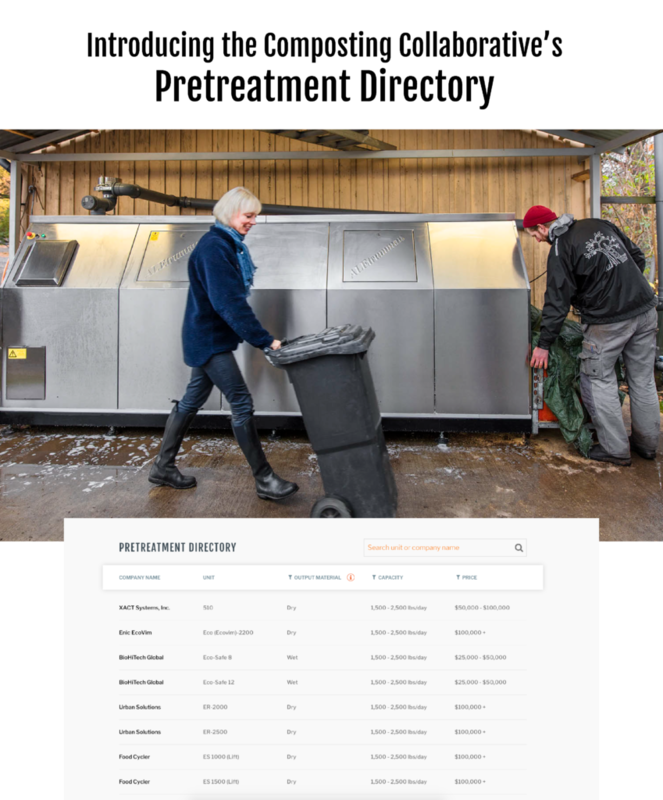 The Pretreatment Directory catalogs the systems currently available on the market that have the ability to help manage food waste and contribute to a more circular economy. Pretreatment Systems are being used by restaurants, grocery stores,universities, corporate campuses, hotels and other food service organizations across the globe to help address the growing concern around food waste. By converting unavoidable food waste into alternative sources of energy and into inputs for more fertile soils, companies can dramatically reduce the amount of methane emissions that occurs when food is sent to the landfill. 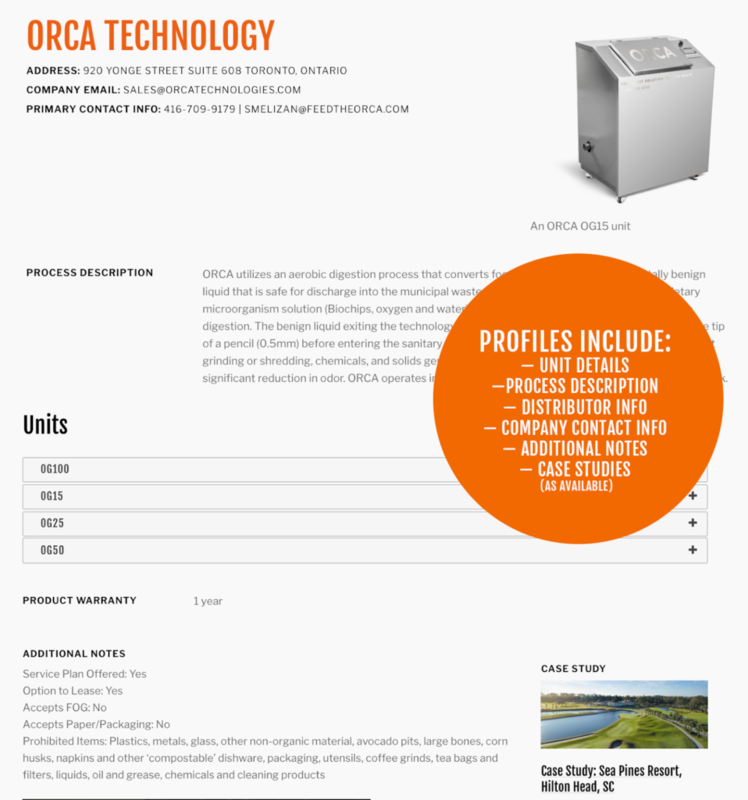 The directory includes both categories of pretreatment systems – wet and dry. Aerobic digesters, also referred to as liquefiers or biodigesters, are wet systems using fresh water to dilute solids in combination with microorganisms to “digest” food waste into a liquid effluent that can be sent “down the drain” via sewer to a wastewater treatment plant, now more commonly referred to as a “wastewater resource recovery facility” (“WRRF”), or pumped to a holding tank for transport to third-party locations like an anaerobic digestion facility, a commercial composting site or a WRRF that accepts “outside” food waste (not conveyed via sewer). Dehydrators and accelerated composters are dry systems. They dehydrate food waste through high temperature heating or through slow turning and agitation over a longer period of time. Outputs from dry systems can be cured into mature compost onsite or transported to a dedicated compost manufacturing facility. Dry output is sometimes also used for livestock bedding on farms or as an input for animal or fish feed. The Composting Collaborative is a joint initiative between GreenBlue, the U.S. Composting Council, and BioCycle Magazine. Our mission is to accelerate composting access and infrastructure to improve soil health and divert compostables to landfill. The Composting Collaborative unites composters, consumer-facing businesses, and policymakers to share best practices and resources, as well as generate innovative solutions to shared challenges.